Hoverboards are, perhaps, too hot item for this holiday season. These self-balancing scooters have become popular among kids and quickly adopted by the “Back to the Future” fans. Now UK customers have to understand safety concerns, after news that some of these gadgets have caught fire. Considering such concerns, the boards have been banned by airlines and they are sadly disappearing from the shelves of some of the online retailers. Amazon has removed the Hoverboards from Swagway. On Friday, Amazon sent a notice to all the sellers of hoverboards and asked for documentation which proves that all the hoverboards listed by them comply with safety standards. Swagway stated that Amazon has shown its concern on the potential risk related to the chargers and batteries. The fires are likely to be connected to overheating of lithium-ion batteries of the boards. 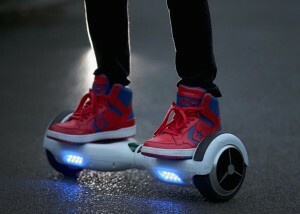 Hoverboards have two wheels supported by a platform and powered by an electric motor to move.